If you pay for your policy annually and have received your renewal invitation you can securely pay for your renewal using our portal. The renewal details on the portal will mirror the invitation so any optional extra products previously selected will remain included. If you need to make any changes to your policy then please call us. We aim to send out details of your renewal about three weeks before your renewal date. If you would like to make changes to your renewal or if your policy is due for renewal within the next three days, please call a member of our renewals team on 01480 484 856 as you will not be able to renew online. If you have an outstanding balance on your file you will need to call us to renew your policy. 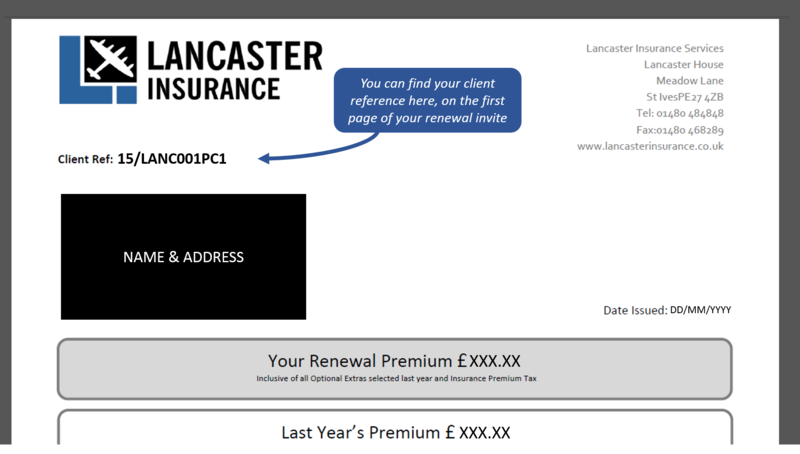 To ensure we securely locate your renewal, please enter your Client Reference which can be found at the top of your renewal pack. Unfortunately the details you have entered don’t match our records. If you think you may have entered your details incorrectly and would like to try again, please click the button below. If you continue to have trouble accessing your renewal, please call a member of our team on 01480 484856 who will be happy to help. © 2017 Lancaster Insurance Services.